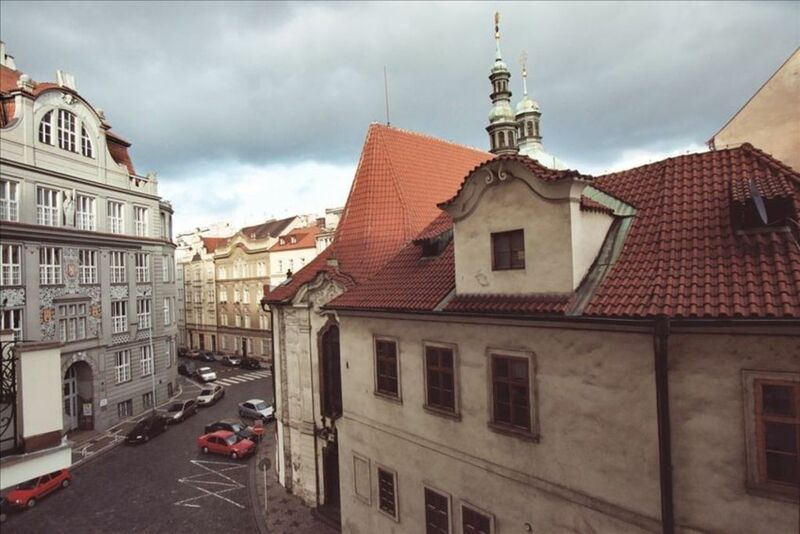 Beautifully reconstructed 2 bedroom/2 full bath apartment with lift/elevator, directly in the center of Prague, close to National Theatre. Located on a quiet street directly across from St. Vojtech Church where Antonin Dvorak played the organ. Easy walk to all sites and multiple pubs, bars, cafes and restaurants in area. Free WiFi and 43" Flat Screen TV with US/English and International Channels. Master Bathroom has large soaking tub with radiant heated floors and towel bar. Quiet Apartment House allows restful retreat from days and nights spent in Prague. Short walk to Trams or Metro and food market just steps away. Other Activities: Playground located close by along with easy access to many cafes, restaurants, pubs, and concert opportunities. Garage&Secure Garage Parking Nearby; Elevator: New Modern Elevator/Lift; Cable/Satellite TV: International Satellite Including ; Monument View: Directly Across from St. Vojtech Church where Dvorak played the organ; WiFi (Wireless Internet): Provided Free of Charge. Enchanting City - Great Apartment ! The apartment was excellent and located within an easy walking of shopping, pubs, groceries, and transportation. I appreciated the nice touches like coffee, lots of guides and maps and excellent directions. The clothes washer was a mystery but I figured it out. Prague is a beautiful and very walkable city and I did not take any taxis or public transportation. The Uber to and from the airport was under $20. Food, drinks and tours are very inexpensive. The money is a little challenging, but I just kept remembering that 500 Krona is approximately $25 US ,so 1000 Krona =$50 and 100 Krona=$5. The check in was an adventure ,because I did not follow directions. I did not print out the voucher to pick up the key, as I had it in my phone. When I got to the office ,quite late, I could not pull it up. The gentleman spoke no English ,so we went to the little bar, # 20, next door and the lady bartender helped explain my situation. I finally got the key, but for a bit I thought that I might be sleeping in a doorway, PRINT OUT THE VOUCHER ! Besides all of the great tours, be sure and visit the St Cyril and Methodius Parish, near the apartment. The church was the site of a famous attach of 800 SS troops against 12 paratroopers who assassinated Reinhard Heydrich. Brave, brave men. I used Get My Guide Tours and they were great. Two of the guides were from Colorado. and very helpful. I did the pub crawl ,but it was too loud, too crowded, and way too young, I left at the first pub. My bad. I'm 77 and should have known better. Maybe 50 years ago. Go to Prague ,rent John's apartment, and try the Pig Knuckle.You won't be disappointed by any of them..
Great location & so comfortable! Apartment is super clean and nicely stocked with coffee & tea to make you feel like a valued guest. Location is perfect - very close to all the nice tourist attractions but located on a quiet street near boulangeries and markets. It is a little inconvenient to have to pickup/turnin key from a building front desk person several blocks away rather than have a host meet you at the apt & show you how things work like a lot of hosts do.. If you are arriving Prague after an overnight flight, just know that you have that extra step & will need to figure out the European dishwasher/washer/dryer yourself. Host is very good at responding to text questions quickly & clearly. Loved our stay in this elegant, comfortable apartment! The location was so convenient, and we enjoyed walking all over this magnificent city. Hope to return someday! The location is perfect, great places to eat close by and the apartment is large and comfortable. Owner was very helpful. The apartment was beautiful and very centrally located. Could not have asked for a better place to stay. There also many nice neighborhood restaurants. Good transportation in buses and Metro. Owner was very responsive to our emails. Such a wonderful city! This property was large and conveniently located. We (two couples) had plenty of space in this apartment to be very comfortable. The location was good--just a couple of blocks to the tram and lots of good restaurants in the neighborhood. They were just far enough off the "beaten path" that many of the patrons were local people with just a sprinkling of tourists. It would have been nice to have dressers or at least luggage racks in the bedrooms so we did not have to keep our suitcases on the floor. It was inconvenient to have to work on the floor to find clothing. The towels were large but very scratchy. They were full of detergent and seemed not to have been rinsed well. Our landlord was easy to communicate with and cooperated when we asked for a different way to return the keys to him. Overall, we were pleased with our choice for an apartment in Prague.